The show is the brainchild of director Yun Ho-jin, who is widely considered as the godfather of Korean musicals thanks to this flashy, glamourous production that follows the 19th-century life of Empress Myeongseong, also known as Queen Min. An adaptation of a novel by Yi Min-yol, the storyline of “The Last Empress” builds up to her assassination by a band of Japanese ronins, a precursor to Japan’s colonial rule in the peninsula. In honor of its 20th anniversary, director Yun has overhauled his beloved musical masterpiece, revamping the production’s choreography, set design, storyline and musical score, adding both new songs and rewriting some of the original songs. Opening its curtains on July 28, with its aesthetically mystifying costumes, high-energy and high-flying martial arts-inspired choreography, the musical highlights a number of Broadway-worthy choreography stunts -- although at times it made some of the singing difficult to catch coupled with the heavy breathing -- and as well as its moments of suspenseful and emotionally tearing scenes that revolve around the power-hungry empress. On a similar historical premise to the current run of Park Myung-sung’s new musical “Arirang,” both productions ooze nationalism and Korean pride in their portrayal of the country’s past political turmoil with Japan. Although the large-scale production of “The Last Empress” was visually stunning with colorful consuming and stage design that was artistic without being overwhelming, the show lacked somewhat its emotional core, at times being overly political. The musical’s portrayal of the empress seemed less focused on her unrelenting thirst for power and her reaching out to foreigner militaries -- which eventually led to her assassination -- and rather seemed to place a greater emphasis on Japan’s motives for a hostile takeover. Rather that feeling moved or inspired by the piece, the storyline can leave some viewers unable to feel anything but resentment toward Japan. The musical features Kim So-hyun and Shin Young-sook in the leading role of the ill-fated Empress Myeongseong and actors Min Young-ki and Park Won as Emperor Gojong. 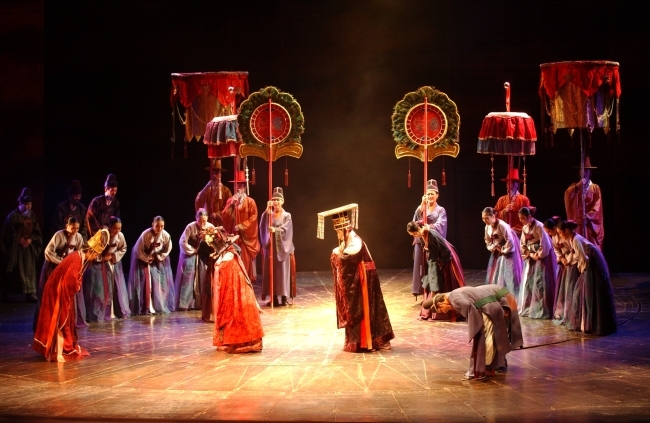 "The Last Empress” will be staged at Seoul Arts Center’s Opera Theater until Sept. 10. Ticket prices range from 60,000 won to 130,000 won. For more information, call (02) 577-1987.